It is as ‘cheap as chips’ – well… as cheap as an Easter Egg – Go on treat yourself!! 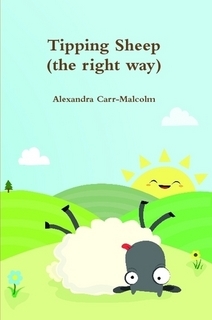 ‘Tipping Sheep (the right way)’ is the first anthology from new author Alexandra Carr-Malcolm. This is an intriguing compilation of poems, spanning over a ten year period of collected works. ‘Tipping Sheep’ will take you on a journey of highs and lows, exploring life, death, and many aspects of the human predicament. From the depths of ‘Bittersweet’ despair, to the humour of ‘Tipping Sheep’ and the musing of ‘Knitting Couplets’. Alex has a unique style of word play and cadence within the lines woven with wit and wisdom. But I do have to ask, is there any wrong way to tip a sheep? Thank you! I felt a bit sheepish using such an obvious pun! Ermmm…. I’ve not personally tried tipping a sheep – but I am assuming it is preferable to tip (sheep) feet grassward than (sheep) feet skyward… just a suggestion! Thank you Roxi – it will be even more awesome when I have figured out how to sort out the e-book!! Congratulations!! I have to wait for kindle version so be sure to let me know. I tweeted and FB this page. I wish you much success. I am working on the e-book version at the moment – It isn’t as straightforward as I thought! I’m struggling to get the artwork on the front!! I will get there but it may be a few days! Congratulations, Alex. Carry on and count your blessings. this was so entertaining and sooo chiseled !